Bulfinch Crossing/Adaptive Reuse of Govn't Center Garage — The Green Engineer, Inc.
Bulfinch Crossing marks a dramatic and unprecedented 4.8-acre transformation in downtown Boston. 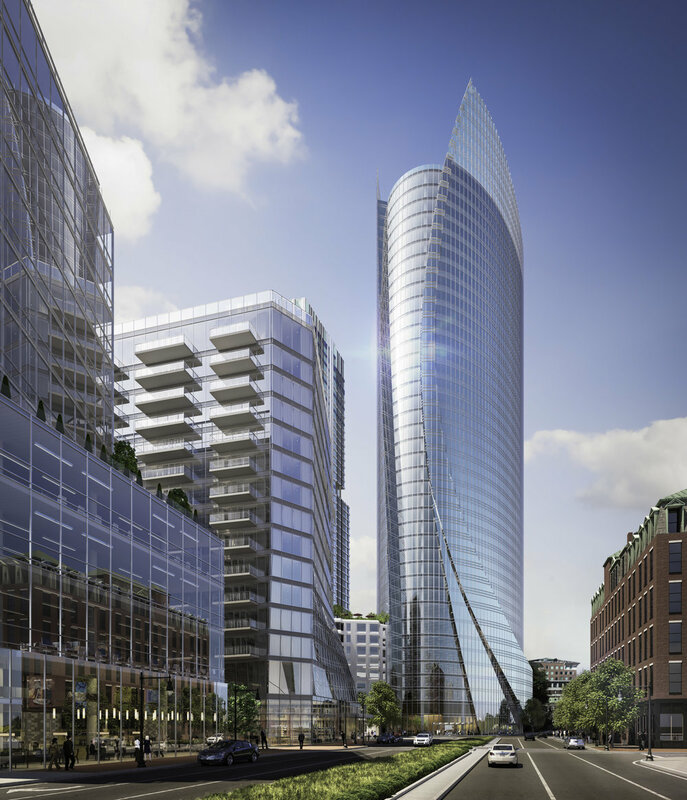 Located in the nexus of some of Boston’s most iconic neighborhoods, it is one of the largest mixed-use development projects ever permitted in Boston. The project aims to reconnect surrounding communities and historical neighborhoods through the deconstruction of the 1960’s, Brutalist, Government Center Garage and opening of the Congress Street corridor. The project will include six new buildings – three towers surrounding a 1-acre green rooftop terrace, and three mid-rise buildings encompassing a new net-zero public plaza. The Government Center Garage was constructed in the late 1960s to accommodate a suburban-based, car-centric professional workforce. It is one of the most visible remaining vestiges of Boston’s historic urban renewal. With current trends demonstrating a migration back into the city, urban renewal projects, such as this 2,300-space above-grade garage which pans 2 city blocks and crosses above a prominent public thoroughfare, are becoming relics of the past. The massive above-grade concrete parking garage divides some of the city’s most prominent neighborhoods. Bulfinch Crossing demonstrates sustainable ways an urban garage can be redeveloped and reused in transformative placemaking. 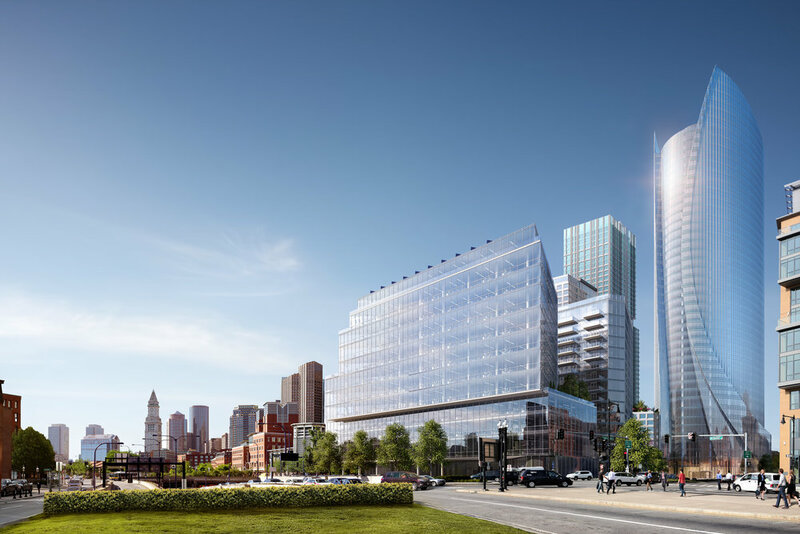 The design of Bulfinch Crossing requires structural demolition of 60% of the Government Center Garage to enable construction of six new buildings and reposition the garage to meet today’s changing parking demands through a forward-thinking, shared parking model. The remaining portion of the garage will be fully integrated into the development and provides all necessary parking, saving significant construction costs and materials. The location of the development is prime for access to a myriad of public transportation options, urban bicycle networks, and dense, walkable communities that all enhance the unique cultural vibrance of downtown Boston while also reducing the occupants direct impact on air quality. The final build out will include 1 LEED Platinum, 4 LEED Gold, and 1 LEED Silver buildings across 2.9 million SF of development. Bulfinch Crossing pays close attention to pedestrian-friendly details and uses a phased approach to improve site characteristics and perceptions of the area, promoting health and wellness. A new Net Zero Public Square will cater to pedestrian “desire-lines” and be activated by ground floor retail, outdoor dining, and onsite public transit access. Employing an adaptive reuse strategy for the Government Center Garage by selectively demolishing the existing garage maximizes the potential of the existing structure, and greatly reduces the embodied energy of the project overall. This also allows for the diversion of potential landfill waste. All portions of the garage to be demolished will be captured and delivered to transfer facilities to ensure recycling opportunities are maximized. In addition, The Green Engineer is involved in the planning and development of the office tower, One Congress, and Residential Tower being developed, providing sustainable design consulting services on each.